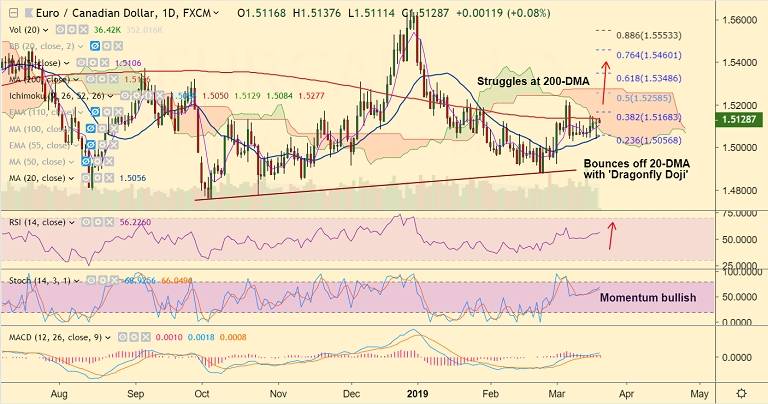 EUR/CAD is extending grind higher, finds stiff resistance at 200-DMA. The pair is trading at 1.5129 at 0615 GMT, up 0.09% till the time on the day. Price action has bounced off 20-DMA support on Monday's trade. The pair has also formed 'Dragonfly Doji' candlestick pattern on the daily charts on Monday which raises scope for further upside. Break above 200-DMA will confirm bullishness. Next immediate resistance lies at 1.5168 (38.2% Fib). Immediate support lies at 5-DMA. Break below 20-DMA could see further weakness.